Are merchants seeing the dramatic drop in chargebacks Visa predicted? Is VCR successfully identifying and preventing fraudulent chargebacks upfront? What other benefits are merchants seeing? What are their frustrations with the system? What Impact Has VCR Had? Visa Claims Resolution brought some of the biggest changes the payments industry has seen in years. We surveyed a wide range of merchants--primarily in the card-not-present space--to get an in-depth look at the impact these changes have brought so far. This comprehensive report reflects experiences from merchants of all sizes, from all areas of the world, and across multiple industries. 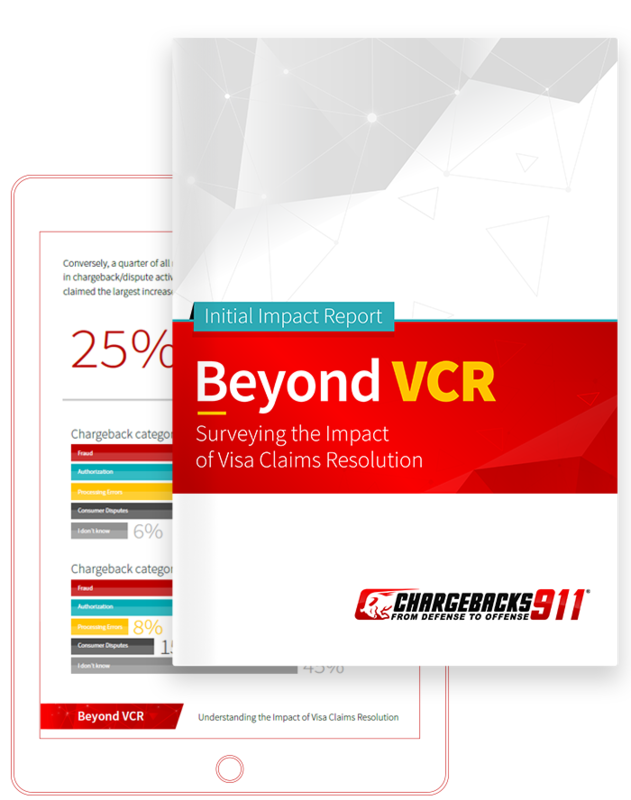 The results reveal Visa Claims Resolution's real-world effect on chargeback management strategies, how merchants are feeling about the new process, and what lessons we may be able to learn from the VCR model that can be utilized in other areas of the payment ecosphere. Download your free copy now! April 13, 2018, marked a significant milestone in the payments industry: The Visa Claims Resolution initiative, also known as VCR, went into effect. This set of new regulations was designed to streamline and simplify the chargeback process, lower instances of chargeback fraud, and standardize the entire system. Merchants and banks had been preparing for this major change for years, and the updated rules went into effect, with promises to pioneer a new framework for chargebacks. Now, several months later, we ask the key question: has VCR had any immediate impact—positive or negative—on the chargeback management process?